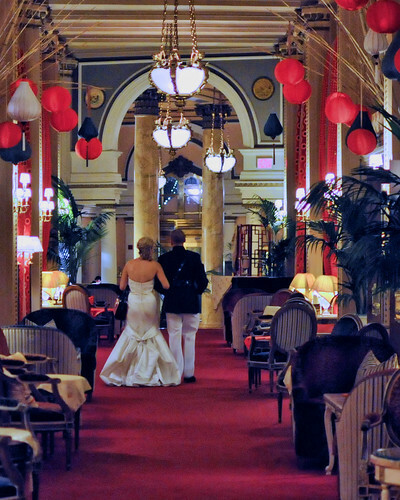 The Social Chair returns to tell us all about finding a DC venue for a DC wedding. After narrowing down the date for our wedding, Fedward and I began the long process of finding the perfect location. Alas, not enough of you voted for us to win a wedding, so our dream venue of the National Building Museum was quickly out of the running. What could be more DC than one of the locations of the Inaugural Balls? 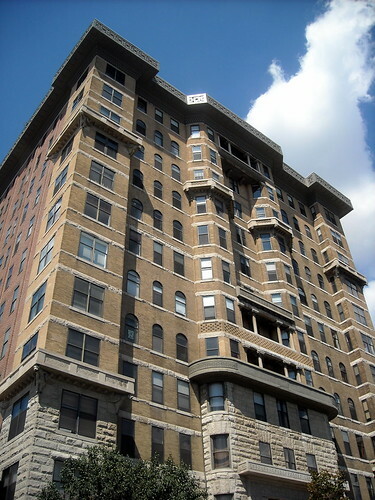 There are a ton of resources for finding a venue in DC. Our best resource? Friends. DC is filled with event venues. Ask around. Many businesses rent their spaces for private events. We joined forces with another recently engaged couple and shared Google docs with places we’d scouted. The Washington Monument is not on axis! I admit it, I’m definitely a perfectionist. I’m a big fan of symmetry and straight lines and order. 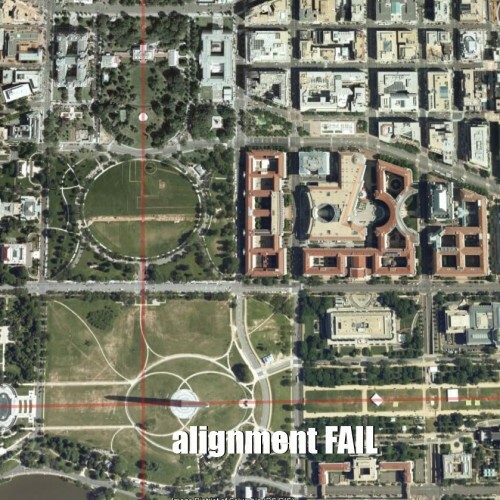 I think that’s one of the reasons I like DC so much– L’Enfant’s plan is so orderly, with the important sites marked by radiating avenues, and the clear axis of power coming straight down the Mall. But something has always bothered me– the center of the White House doesn’t look like it lines up with the Washington Monument. Why, in a city so based on order and symmetry and strong axes, does the Washington Monument not line up?! Because the ground right at the intersection of the center of the White House and the center of the Capitol was not strong enough to support such a giant structure. 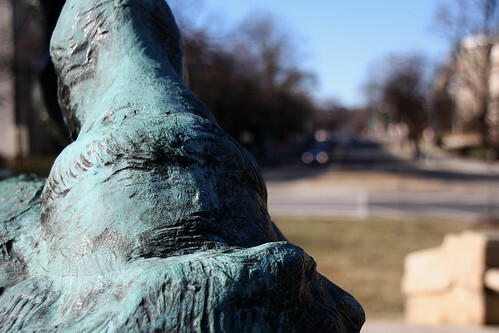 Originally, L’Enfant had proposed a small equestrian statue of George Washingon at the intersection of the east-west axis of the Capitol and the north-south axis of the White House. But plans changed, and the Washington Monument went there instead. The Monument was larger and heavier than anything that L’Enfant had envisioned, so it had to be shifted off axis to avoid less solid, marshy ground. The Monument now rests “about 300 feet southeast of the crossing point of L’Enfant’s two primary vistas” (from Grand Avenues, page 271). Mystery solved! So has anyone besides me noticed and been bothered by this? Or am I the only one who will be sleeping easier tonight knowing that there’s a reason behind the off-axis placement of the Monument? * Ok, so I realize this isn’t a myth exactly. But it’s something that’s always bothered me about DC that I couldn’t figure out. If you have a DC myth in mind that you’d like me to bust/confirm, please e-mail me at shannon (at) welovedc.com. Thanks! Welcome to another edition of DC Mythbusting! Last week we discussed how, contrary to popular belief, the height limit wasn’t based on the Capitol or the Washington Monument. This week I’m here to debunk the myth of the traffic circles in DC. I have heard from a couple different sources that supposedly Pierre L’Enfant designed the traffic circles in Washington DC as artillery bases to defend the city. It is said that cannons were placed in the center of the circles to defend against cavalry. This myth has some traction out there– it can be found in transportation magazines, Washingtonian magazine, and even a book.